Since 1796, Majani has produced high-quality chocolate, following every stage of the production with special care to give its chocolate a unique and extraordinary aroma. The Carenero Superior cocoa from Venezuela is a kind of cocoa with nuances of dried fruit and spices: the perfect base for our Chocolate flavoured GelatoMadre. 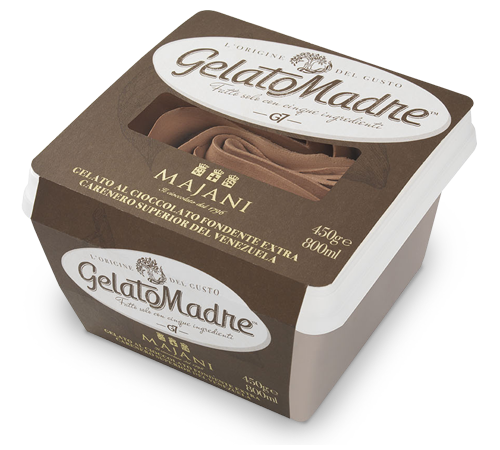 GelatoMadre Cioccolato Fondente Extra Majani with Carenero Superior from Venezuela: only 100% Italian natural ingredients for a unique Gelato going back to the origin of taste. The authentic taste of a real traditional Gelato made only with few and simple natural ingredients.